SACRAMENTO, CA––8:00am PST: Activists involved with the nationwide Rock Against the TPP celebrity concert tour are now taking their message directly to local lawmakers, flying a 25’ inflatable blimp outside Representative Ami Bera’s office at 8950 Cal Center Drive, Sacramento, CA, protesting the Congressman’s recent statements in support of the unpopular and anti-democratic Trans-Pacific Partnership (TPP) deal. See more PHOTOS and VIDEO of the blimp at the bottom of this post. 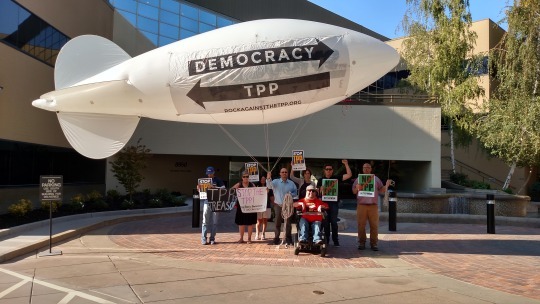 “Ami Bera turned his back on constituents when he voted to fast track the TPP. 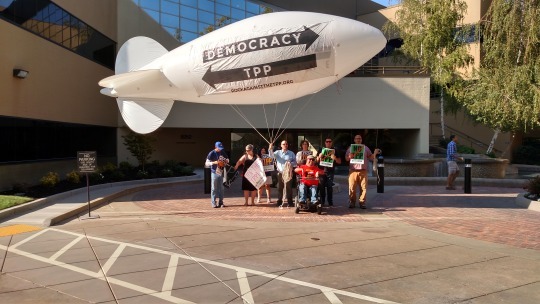 We’re hoping a 25-foot blimp flying right outside his office makes it clear to him that supporting the TPP is betraying his constituents,” said Robert Longer of CWA Local 9421. In January, Rep. Bera failed to secure the endorsement of the local Democratic Party for his re-election to Congress, in large part due to continued constituent anger over his 2015 vote in favor of “fast track” legislation that will allow the TPP to circumvent ordinary congressional review, amendment and debate procedures. He is among a small minority of congressional Democrats not publicly opposed to the TPP. The airborne protest is part of the Rock Against the TPP tour, a nationwide series of large-scale concert, protest, and teach-in events featuring high profile musicians and celebrities like Tom Morello (Rage Against the Machine) Golden Globe nominated actress Evangeline Lilly (Lost, The Hobbit, Ant-Man), hip hop icon Talib Kweli, comedian Hari Kondabolu, popular punk band Anti-Flag, Jello Biafra of the Dead Kennedys, and Danbert Nobacon of Chumbawamba. The goal of the tour is to raise awareness about the Trans-Pacific Partnership (TPP) agreement, the unpopular and anti-democratic “trade deal” that has been a contentious issue in the Presidential election and at both of the recent political conventions. Organized by legendary guitarist Tom Morello’s new label, Firebrand Records and digital rights group Fight for the Future, the tour is sponsored by Backbone Campaign, Citizens Trade Campaign, Communications Workers of America, CREDO, Demand Progress, Friends of the Earth, the International Labor Rights Forum, Private Internet Access, Public Citizen, Sierra Club, SumOfUs, the Teamsters, and United Steelworkers. See photos and video from the tour kick-off event here. The tour stopped in San Diego earlier this month, where activists flew the same blimp outside Rep Scott Peters’ office. The tour has upcoming stops in Seattle, Portland, and San Francisco. Contact: press@fightforthefuture.org for more info.